Frankly speaking, I was quite unsure what to expect as we approached the Skid Row address of the Midnight Mission for our second Penn Serves LA Event. My ten-year old son John and I joined 15 other local Los Angeles Penn alumni at the Mission to serve lunch to the homeless. Penn Serves is a new initiative to encourage various Los Angeles alumni to serve together in community service activities at established local nonprofits. The downtown-based Midnight Mission is the longest continuously operating nonprofit in Los Angeles serving the homeless. While I knew it would be an interesting experience, little did I know how much I would observe in just a few short hours. Justin Gordon, W’05, Snehit Neenakri, GEN’09, Terry Baris, C’84, Irene Park, C’05, Christopher Regan, Trisha Fowler, C’89, Cheryl Miller, Ian Davis, Alexa Ebner, Elizabeth Kopple, C’94, WG’99, Denise Winner, W’83, Leanne Huebner, W’90, John Huebner and more all serve. Our team was first greeted by an articulate, middle-aged man named Ryan, who would serve as our tour guide. Ryan first showed us the outdoor courtyard (no larger than 40 feet by 80 feet), where more than 100 homeless sleep each night literally head to toe. Some individuals have been sleeping there consistently since the courtyard’s opening in 2005. Our guide shared that some homeless are steadfastly resistant to accepting help of any kind and how it is an accomplishment in itself just to get the homeless to sleep in this enclosed courtyard with its heated lamps and security. Ryan understood the mentality of this population as he then shares details of his own recent stint with homelessness as a heroin addict. Thanks to the Mission and its programs, he is now on his way to living a clean, healthy life and hopefully reconnecting with his 6-year old daughter. Ryan informs us of the root causes of homelessness. Of the 51,000 homeless in L.A. County, the Mission has found that roughly one third of them suffer from mostly-untreated mental health problems, while another third have abused alcohol or drugs. The final third have simply fallen on hard economic times. Centers like the Mission look to help in any way it can serve this population. 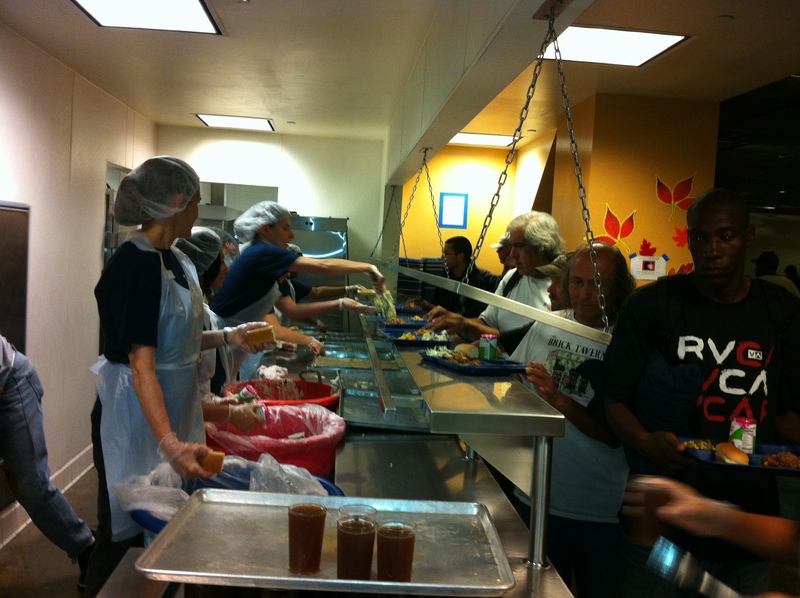 Currently, the Midnight Mission is serving about 90,000 meals a month, its highest rate since the Great Depression. Next stop was the Multipurpose Room where approximately 200 people sat on metal folding chairs with eyes pinned on two 30’ inch television screens. Minus the sound of the TVs, you could hear a pin drop but I discounted that observation as a huge interest in the particular program. We then pass by their small barber shop where volunteer beauticians regularly offer free haircuts and their small library where the homeless can feel comfortable checking out books. Next, we visit their gym where the residents of the Mission are required to participate in physical education regularly. Here, residents play league basketball against corporate teams and the L.A.P.D. After the tour, we head off to work, as the lines were forming outside for entrance. We are told to expect to serve 700-800 meals over the next hour or so. The sheer amount of meals served is always larger at the end of the month, because many of the homeless’ SSI and disability payments would have been depleted by now. Ryan shares that 64% of the homeless whom qualify for government assistance do not actually receive it. 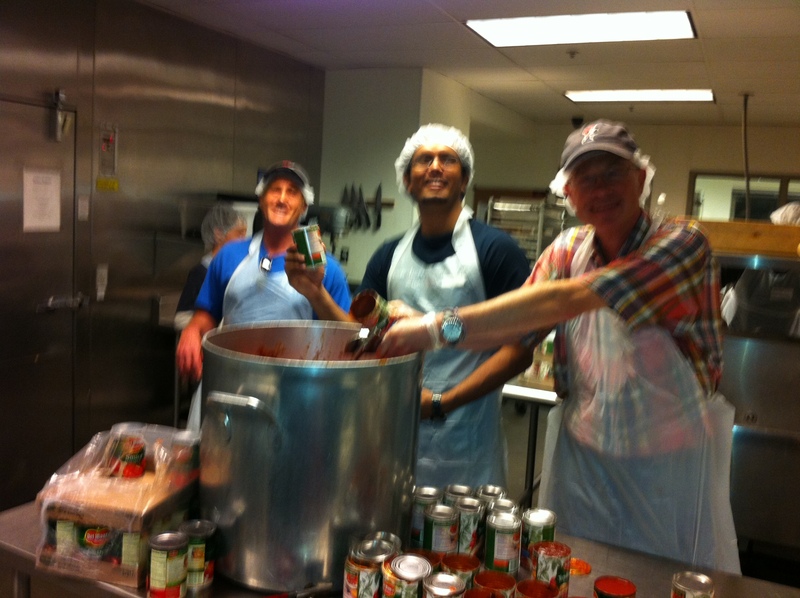 Ian Davis, Snehit Neenakri, and Christopher Regan preparing tomato sauce. Penn alumni, now costumed in hair nets, latex gloves and aprons, head off to man the cafeteria line for an inviting meal of beef macaroni, corn, salad, yogurt, and bread. My son John and I head with a few other alumni inside the kitchen to open up hundreds of tomato sauce and Snapple cans. John finds his nitch dumping Snapple in a large pot next to another kitchen helper, who later compliments him for working hard. 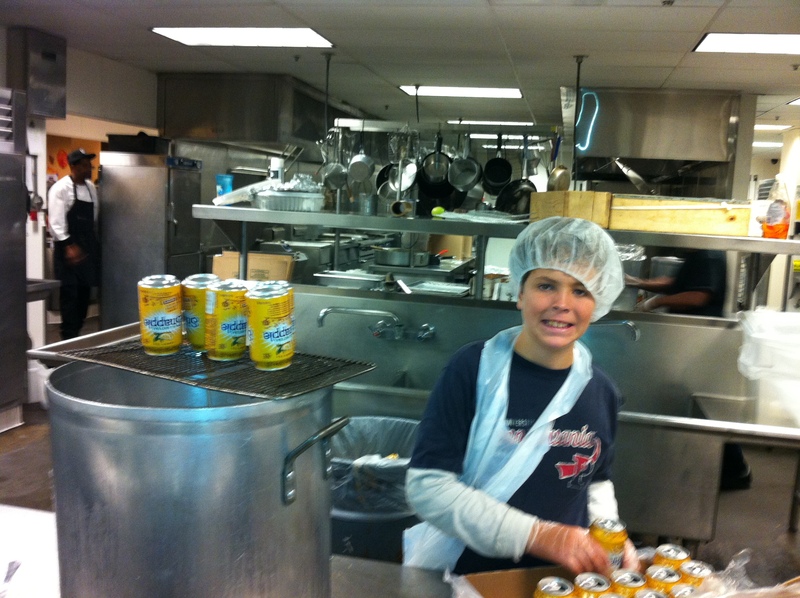 10-year old John Huebner finds his job. Restless, I meandered over to check out the front line. The line for food was long, straight and orderly with at least 100 people waiting every time I peeked. Several would re-enter the line for seconds and thirds. My normally cheery self just wanted to smile at each to offer a bit of joy but very few would even make the eye contact to accept the warm gesture. Only one in ten actually even spoke, one volunteer calculated. Several just pointed and grunted to where they wanted the food placed. The room was somber. The lunch line staffed by Penn Alumni. Shifting from kitchen to the line, I again noticed more lack of talking and interacting as the homeless stood in line, gathered their food and poured over their free meal. How could a few hundred people be in a room “enjoying” a meal with little to no conversation? I was comparing the noise level to that of my sons’ school cafeteria – which is quite loud despite being half this room’s size. The lack of conversation and camaraderie reflected the fact that these people are in survival and existence mode; perhaps they just didn’t want to connect even with each other. The streets are tough places to live; I suspect there are many social norms that would differ greatly from mainstream society. Perhaps, silence is one of those norms. Why draw attention to yourself when, according to one study, nearly 43% of homeless suffer from physical attacks using a weapon? My personal highlight was interacting with a team with the men working inside the kitchen. 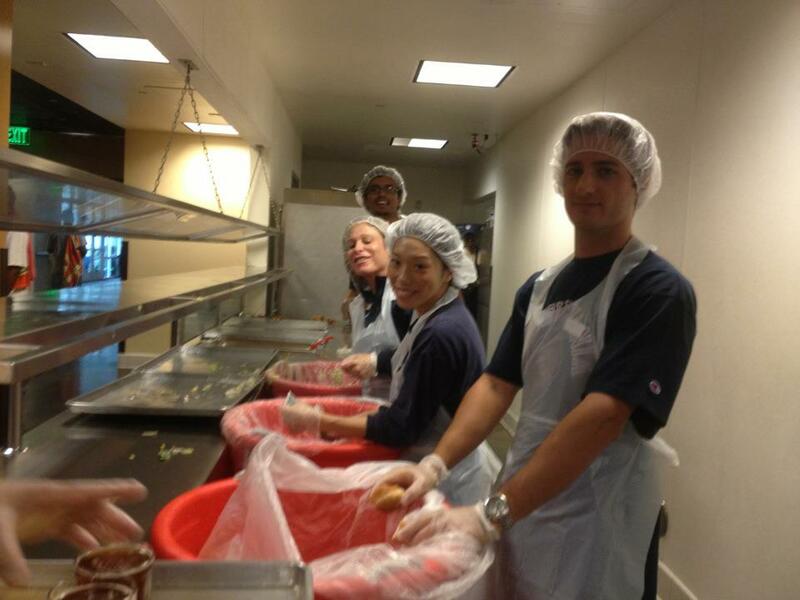 Each kitchen helper was currently living in the Mission and this job was part of their path out of homelessness. Midnight Mission has a 12-step program to self-sufficiency, and I could feel the power of the program working right there at that moment. These kitchen workers were noticeably happier, with the value of having work for their hands that day. We joked over the hamburger sliders donated from a “fancy restaurant” as we contemplated why they called them “sliders” in the first place. One worker shared how he looked forward to finishing the program and hoped to find a job in food service. The head kitchen worker joked that he wanted to be in our photos and how he wants us to come back again. In the brief time I was there, all of these residents were respectful, hardworking, and very appropriately funny. You could tell they enjoyed each other’s company and were grateful for the extra hands from us. The stark difference between the men preparing the food (all formerly homeless) and those on the other receiving line was quite remarkable and noteworthy to me. From my novice eye, the difference seemed to be the hope for the future and the knowledge they now were on the path made possible by the privately-funded Mission. Perhaps the difference also was the fact that inside the kitchen the men had purpose – soup to stir in large vats, large metal trays to wash, plastic cups to fill and extra napkins to find. By the time lunch was finished and the alums prepared to leave, the kitchen staff was already planning and talking about the dinner responsibilities. My fellow volunteers and I shared that we couldn’t help but thinking our own problems paled in comparison to those of the individuals we fed and met that day. The average stay inside Midnight Mission is 18 months, whereby approximately two men graduate each week, or roughly 100 men a year. Seeing the difference between those within the kitchen and those accepting the food demonstrated to me the power of intervention programming. The Mission is and has always been funded 100% by private foundations and individuals. If only we had more Midnight Missions in the world. 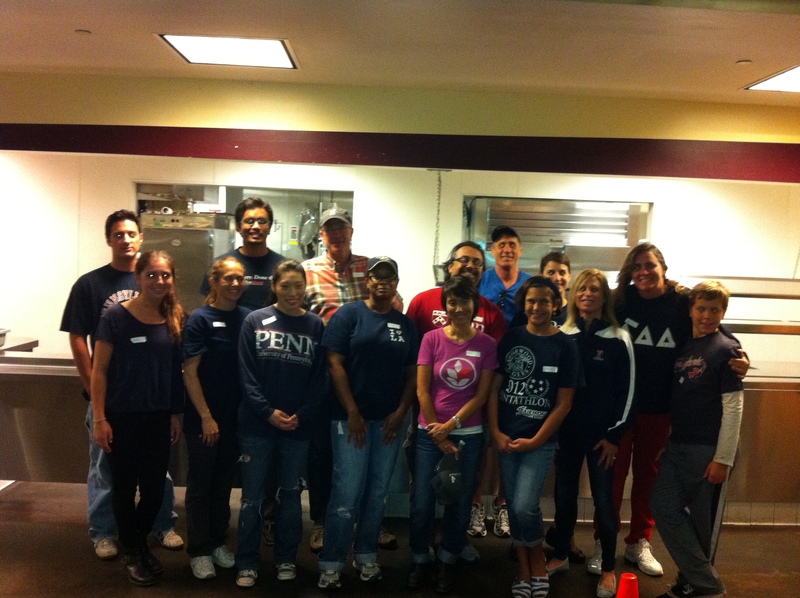 Thank you to all the Penn Serves volunteers for the Midnight Mission. We hope you will serve again for the next event. 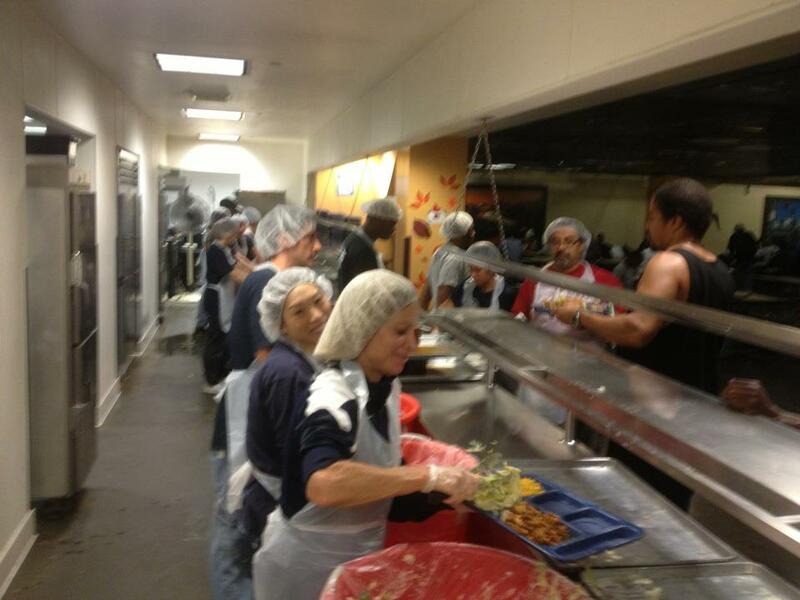 Thank you to Denise Winner for arranging our group’s participation at Midnight Mission for Penn Serves LA. Contact pennservesla@gmail.com for future events or if you want to get more involved. 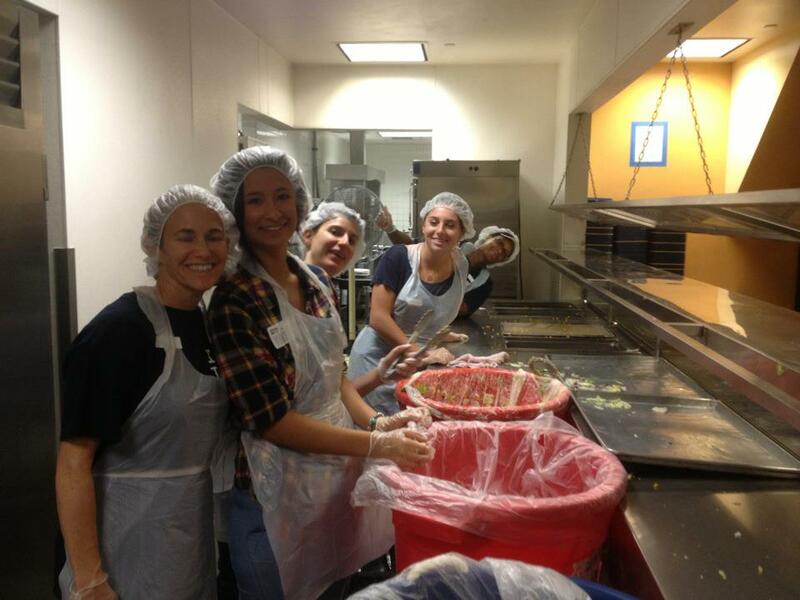 To read the post about the first Penn Serves LA event, at Turning Point Shelter in Santa Monica, click here.